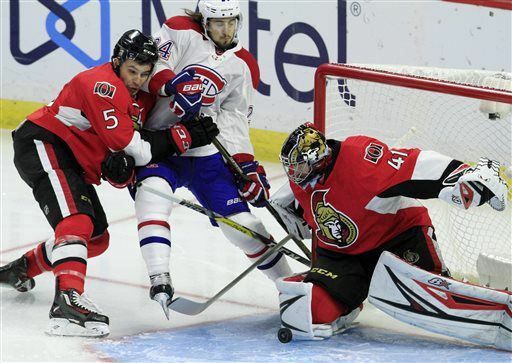 OTTAWA — Defenseman Erik Karlsson scored the winner in a shootout to give the Ottawa Senators a 4-3 victory against the Montreal Canadiens at Canadian Tire Centre on Saturday. The Senators had a 2-0 lead on goals by Ryan Dzingel and Zack Smith, but the Canadiens rallied on two goals from defenseman Jeff Petry and rookie forward Artturi Lehkonen‘s first NHL goal to take a 3-2 lead three minutes into the third period. Forward Tom Pyatt scored his first goal for the Senators with 2:33 left in regulation to send the game to overtime. The Canadiens played their second straight game without goaltender Carey Price, who has the flu, and Al Montoya made 35 saves. Karlsson scored on a shot off the post in the fourth round of the shootout. “I don’t really have a favorite move,” Karlsson said. “I don’t know how many shootouts I’ve taken, I usually take one, maybe two a year. And sometimes it goes in. Craig Anderson made 21 saves for the Senators. Kyle Turris scored for Ottawa in the shootout and Alexander Radulov scored for Montreal. Lehkonen tied the game 2-2 at 2:50 of the third period, fighting off Ottawa forward Phil Varone to jam a puck underneath Anderson at the right post. The Senators had a 5-on-3 power play for 1:49 starting at 4:06 of the third period, but had one shot. Petry played his first game of the season after injuring his knee during training camp. In the shootout, Karlsson skated in on Montoya and scored on a snapshot that went off the left post and into the net just inside the right post. It became the winner when Canadiens forward David Desharnais, with a chance to force a fifth round, missed on his shot. With five minutes to go in regulation time and the Canadiens ahead 3-2, the Senators broke through the Canadiens defense for a couple of close-in shots. Senators defenseman Dion Phaneuf‘s shot was redirected by Smith and Montoya stopped it, then made a save on Derick Brassard‘s attempt to score on the rebound. Canadiens forward Paul Byron was sent off for slashing at 3:55 of the third period and was followed 11 seconds later by Canadiens captain Max Pacioretty for holding Karlsson. The Canadiens penalty killers did a great job of keeping the Senators to the outside during the 5-on-3 advantage and allowed the Senators just one shot during the 1:49 the Canadiens were down two men. Both of Petry’s goals were the result of Canadiens forwards paying the price and going to the front of the net. Lehkonen was screening Anderson on Petry’s first goal and Brendan Gallagher and Andrew Shaw set up a screen on Petry’s second goal which came two seconds after a penalty to Phaneuf expired. “We had a really slow start. For the first half of the game we weren’t skating the way we’re capable of skating. You’ve got to give the Sens a lot of credit, they played good. We made some adjustments and that was positive for us and halfway through the game I thought we started to skate, put more pressure and attack the net a lot more than we did in the first half.” — Canadiens coach Michel Therrien. “They came out firing. It was a fun atmosphere. We knew they’d come out firing a little bit. They got two quick goals and we responded. We hung in there and had a couple of big penalty kills and I think that took the momentum. At the end of the third I thought we were taking it to them pretty good and then they got that break to tie it up.” — Canadiens goaltender Al Montoya. “You just try to be patient and out wait him. He’s got his head up to see what he might have available, and he just kind of lost the puck there. We’ll take it any way we can. Bobby [Ryan] misses the net and they get a freebie save, on that one, so we’ll take the freebie on the other end, too.” — Senators goaltender Craig Anderson on facing Desharnais in the shootout. “The shots were 38-24 for us. The goal of this team, first and foremost, is to give up less shots. You play against such a good team that’s supposed to be a top two [team] with Tampa Bay Lightning. We knew we were up against a really good team, and our guys came out charging.” — Senators coach Guy Boucher. The Senators were 29th in penalty killing last season. They are 7-for-8 killing penalties so far this season. … Karlsson led all skaters with 30:37 of ice time. Defenseman Shea Weber led the Canadiens with 29:27. … Senators forward Mike Hoffman had 12 shot attempts (six shots, three blocked, three missed). … Senators center Jean-Gabriel Pageau won 13 of 15 faceoffs (87 percent). Canadiens: Host the Pittsburgh Penguins on Tuesday (7:30 p.m. ET; SN360, TVA Sports, ROOT, NHL.TV). Senators: Host the Arizona Coyotes on Tuesday (7:30 p.m. ET; TSN5, RDS, FS-A, NHL.TV).